After a string of stellar successes, The Chilean & American Chamber of Commerce (CACC) managed to scale new heights, presenting one of its most powerful and internationally connected awards ceremonies. This year’s celebration at the Bellevue Hyatt crystalized the Chamber’s mission, spotlighting business superstars Aramark and the Oppenheimer Group, coupled with an outpouring of hearty congratulations from over 300 movers and shakers from the maritime, diplomatic and business sectors, attending the Chilean & American Chamber of Commerce 2014 Friend of Chile Awards ceremonies. Visionary business leader John Anderson, President, Chairman and CEO of The Oppenheimer Group received the Chamber’s Lifetime Achievement Award. For almost forty years, John Anderson’s finely-honed business instincts have left an indelible mark on a global industry, while building ‘Oppy’ into one of Canada’s strongest and most successful produce-marketing enterprises. The Oppenheimer Group currently utilizes all four major facilities on the Delaware River: Holt Terminal in Gloucester City, New Jersey; Tioga Marine Terminal and Packer Avenue Marine Terminal in Philadelphia, and the Port of Wilmington, Delaware, importing an assortment of fruits and berries. In a typical year, the Oppenheimer Group brings 4.5 to 5 million cartons of Chilean produce through the Ports of the Delaware River. 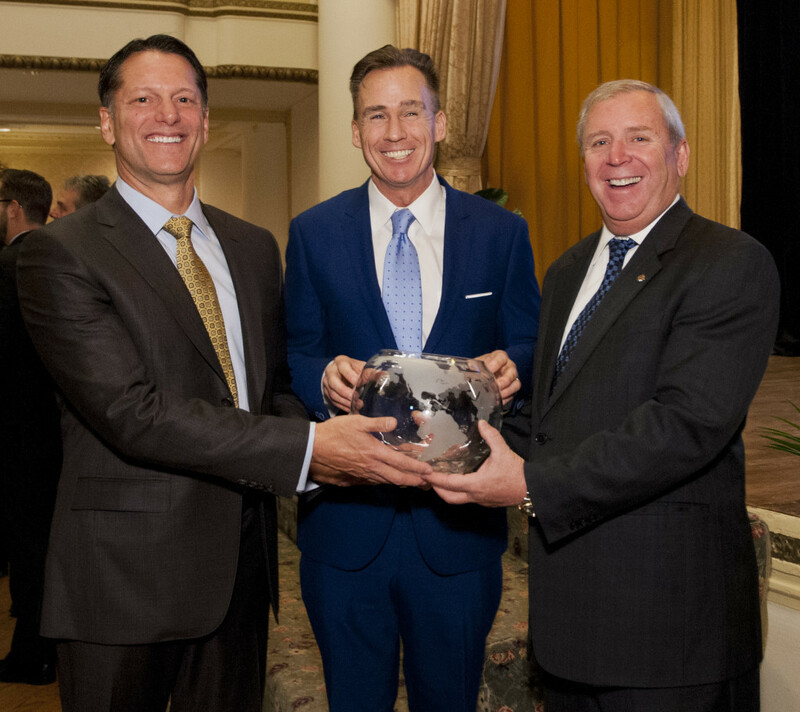 “It is truly an honor to be personally recognized in this way, though much of the credit must be given to the strong working relationships built over many years between The Oppenheimer Group locally and the network of service providers that have long supported and grown with the Chilean industry along the Delaware River,” said John Anderson, Chairman and CEO of The Oppenheimer Group. The Friend of Chile Award went to Aramark and was received by their dynamic Chief Operating Officer of Emerging Markets, Martin Welch, accepting the award on behalf of his entire team at the company. Welch is one of the leaders responsible for helping expand the global frontiers of Philadelphia’s international powerhouse. Aramark has operated in Chile for the past 13 years. With headquarters in Santiago, Chile and approximately 20,000 employees in the country, the company is the largest employer in Chile, serving the country’s mining, education, healthcare and business and industry sectors. Through its Chilean operations, Aramark also serves customers in Argentina, Colombia and Peru. Aramark’s President for Latin American Operations Pablo Achurra was in town for the ceremonies and also represented the company at the White House, receiving appreciation and congratulations from the Obama administration for Aramark’s life-saving engineering success in feeding the Chilean miners. “We were called in by Chile’s Association of Safety, Achurra said, “the mine was not our client.” The Association said, ‘can you figure out how to get food to those miners?’ We said, ‘Yes we can.’” Aramark then rigged up special tubes and designed a way to get hot meals to the men, keeping them alive and very well fed for 68 days. Except for the last days, when the miners had to fit into the recue tubes that would propel them to safety. Achurra says Aramark worked with NASA to calculate the calories needed to keep them safe but small enough to fit in the extremely tight rescue capsule for the almost half mile ride through rock to actual daylight. Sponsor opportunities available! Contact Ricardo Maldonado at 215-790-3769 or [email protected] for more details and to learn about sponsorship opportunities. Click here to see the video from Latin America 2014. Click here to see photos from Latin America 2014.